Diné Bikéyah, or Navajo land, is larger than 10 of the 50 states in America. This vast land is unique because the people here have achieved something quite rare: the ability of an indigenous people to blend both traditional and modern ways of life. The Navajo Nation truly is a nation within a nation. In years past, Navajo land often appeared to be little more than a desolate section of the Southwest, but it was only a matter of time before the Navajo Nation became known as a wealthy nation in a world of its own. The discovery of oil on Navajo land in the early 1920s promoted the need for a more systematic form of government. In 1923 a tribal government was established to help meet the increasing desires of American oil companies to lease Navajo land for exploration. Navajo government has evolved into the largest and most sophisticated form of American Indian government. Navajos are unsurpassed in their ability to create exquisite and multifaceted art. Nowhere is this more true than in the beauty of their silversmithing. It is believed that Navajos began working with turquoise after returning from the "Long Walk" to and from Fort Sumner, New Mexico in 1868. Aside from its ornamental value, turquoise is especially important to the Navajo people because of its religious significance and its representation of a well-being in an individual. Navajos believe that the Holy People, who originated with First Man and First Woman, made baskets for ceremonial purposes. Each part of the basket has a special significance. Today, apart from their ceremonial usage, Navajos also use baskets as household displays. Navajo rugs weaving is recognized throughout the world, not only because of its aesthetic qualities, but also because of its unique stylistic changes. Navajo women believe the art of weaving was taught by Spider Woman, who constructed a loom according to directions given by the Holy People. Today, distinct styles of rugs identify designs woven in different regions: Two Gray Hills, Ganado, Teec Nos Pos, and Crystal--all famous world-wide. Sandpainting, another unique and symbolic art form originating with the Holy People, was and still is primarily ceremonial. Sandpaintings represent an array of ceremonies and sacred songs. The Navajo Nation flag, designed by Jay R. Degroat, a Navajo from Mariano Lake, New Mexico, was selected from 140 entries, and was officially adopted by the Navajo Nation Council on May 21, 1968 by Resolution CMY-55-68. On a tan background, the outline of the present Nation is shown in a copper color with the original 1868 Treaty Reservation in dark brown. At the cardinal points in the tan field are the four sacred mountains. A rainbow symbolizing Navajo sovereignty arches over the Nation and the sacred mountains. In the center of the Nation, a circular symbol depicts the sun above two green stalks of corn, which surrounds three animals representing the Navajo livestock economy, and a traditional hogan and modern home. Between the hogan and the house is an oil derrick symbolizing the resource potential of the Tribe, and above the sun, the modern sawmill symbolizes he progress and industry characteristic of the Navajo Nations' economic development. 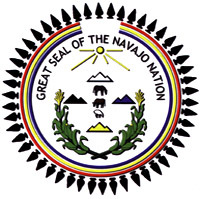 The Great Seal of the Navajo Tribe, designed by John claw, Jr. of Many Farms, Arizona, was officially adopted by the Navajo Tribal Council on January 18, 1852, by resolution CJ-9-52. The 48 projectile points outlining the seal symbolize the Tribe's protection within the 48 states (as of 1952.) The opening at the top of the three concentric lines is considered the east; the lines represent a rainbow and the sovereignty of the Navajo Nation. The rainbow never closes on the Tribe's sovereign immunity. The outside line is red, the middle is yellow and the inside is blue. The yellow sun shines from the east on the four mountains sacred to the Navajo. These, located at the cardinal points, are in their ceremonial colors: White in the east represents White-Shell Woman; blue in the south represents Turquoise Woman; Yellow to the west represents Abalone Woman; and Black to the north represents Jet Black Woman. Two green corn plants, symbolic as the sustainer of the Navajo life, decorate the bottom of the seal, with tips of the yellow pollen which is used in many Navajo ceremonies. In the center are a sheep, a horse and a cow, all symbolizing the Navajo livestock industry. In May of 1988, the Navajo Nation Council amended the original working from the Great Seal of the Navajo Tribe to the Great Seal of the Navajo Nation. They also increased the number of arrowheads to 50 to include representation of the states of Hawaii and Alaska. The Navajo people, the Diné, passed through three different worlds before emerging into this world. The Fourth World, or Glittering World. The Diné believe there are two classes of beings: the Earth People and the Holy People. The Holy People are believed to have the power to aid or harm the Earth People. Since Earth People of the Diné are an integral part of the universe, they must do everything they can to maintain harmony or balance on Mother Earth. It is believed that centuries ago the Holy People taught the Diné how to live the right way and to conduct their many acts of everyday life. They were taught to live in harmony with Mother Earth, Father Sky and the many other elements such as man, animals, plants, and insects. The Holy People put four sacred mountains in four different directions, Mt. Blanca to the east, Mt. Taylor to the south, San Francisco Peak to the west, and Mt. Hesperus to the north near Durango, Colorado, thus creating Navajo land. The four directions are represented by four colors: White Shell represents the east, Turquoise the south, Yellow Abalone the west, and Jet Black the north. The number four permeates traditional Navajo philosophy. In the Navajo culture there are four directions, four seasons, the first four clans and four colors that are associated with the four sacred mountains. In most Navajo rituals there are four songs and multiples thereof, as well as many other symbolic uses of four. When disorder evolves in a Navajo's life, such as an illness, medicine men use herbs, prayers, songs and ceremonies to help cure patients. Some tribal members choose to be cured at the many hospitals on the Navajo Nation. Some will seek the assistance of a traditional Navajo medicine man. A qualified medicine man is a unique individual bestowed with supernatural powers to diagnose a person's problem and to heal or cure an illness and restore harmony to the patient. There are more than 50 different kinds of ceremonies that may be used in the Navajo culture--all performed at various times for a specific reason. Some ceremonies last several hours, while others may last as long as nine days. The sky darkens with clouds. Thunder rolls, lightning flashes and then the rain pours down. It is the male rain. The female rain, on the other hand, is gentle, with a soothing effect. In Navajo belief, there is a male and female to all things above below and around us. To Navajos, rain is one of the four main elements of Earth; light, air, and pollen are the others. It is said by wise ones that if you have no respect for the rain, and your thoughts and words are bad while it rains, the sacred forces will punish you. The Navajo have a ceremony that restores harmony and balance with nature. Corn is one of the main staples of Native American life. It's an important food item, and every spring, many Navajo families plant large fields of corn. But its use goes far beyond just nutrition--it's also an important part of Navajo prayer. The pollen of the corn is dusted off the tassels and used in ceremonies as a blessing, and is offered in prayer. Corn is used to make many traditional dishes, including kneel-down bread, blue corn mush, dried steamed corn and roasted corn. The corn is also used during a ceremony when a Navajo girl comes of age--a large corn cake is cooked underground in a circular pit lined with corn husks. Many Navajos still use a traditional cradle board to keep their babies safe and protected. Made with cottonwood, pine or cedar laced together with thin strips of leather, the cradle boards feature a wide, wooden hoop over the baby's head that protects the child. Navajos believe the flat boards will give the baby a strong, straight back, and that a soft supporting pad will help the infant form a nice rounded head. The cradle board is blessed with corn pollen, prayers, songs and good thoughts for the baby. Used in religious ceremonies at traditional Navajo weddings, the woven wedding basket has a distinct pattern of representation. The edge of the basket, a lighter color, represents the brightening skies as dawn approaches. The center design features four points to represent the Navajo's four sacred mountains, and the opening into the center (which Navajos believe should never be pointed downward) signifies an outlet for our thoughts. The bright red weave is the hallmark of sunshine, and is a blessing for Navajo health and spirituality. Black is for darkness, and a time to restore our bodies and minds. The lacing of the weave around the basket's edge represent our roots and human life. And the very center of the basket is representative of the emergence of he Diné, the opening for the First Holy One to come into the First World.